Welcome to Marathon County’s official Uniform Addressing website! Here is where you’ll find the latest updates on the Uniform Addressing project, downloadable checklists, maps, and reference guides, links to helpful resources, and more. We hope you’ll check back often to keep yourself informed about this county-wide project. Type your current (old) street number in the blank below and select "search" to find your new address! Please note: This search only includes addresses that have received an official notice. 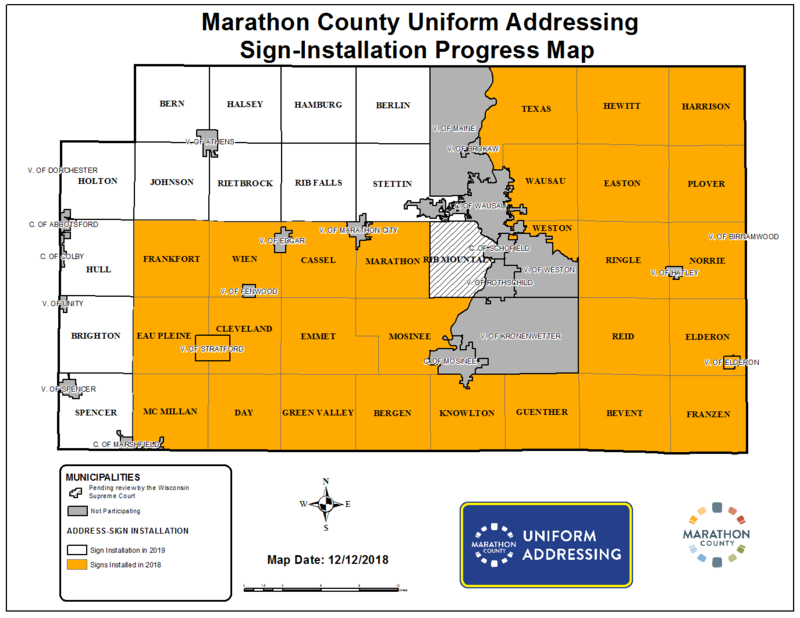 Marathon County’s Uniform Addressing project will pause temporarily beginning in November 2018, when snow and frozen ground will prohibit the installation of any more street and address signposts. The 12 municipalities of Berlin, Bern, Brighton, Halsey, Hamburg, Holton, Hull, Johnson, Rib Falls, Rietbrock, Spencer (town) and Stettin will receive new Uniform Addresses beginning in May 2019, when the countywide re-addressing project is scheduled to resume. Until then, citizens, business owners, and landowners in those municipalities should continue to use their current address (for driver license renewals, check re-ordering, etc.) until they receive an Official Notice of address change from the County next year. For public safety reasons, new addresses cannot be released to the public before then. 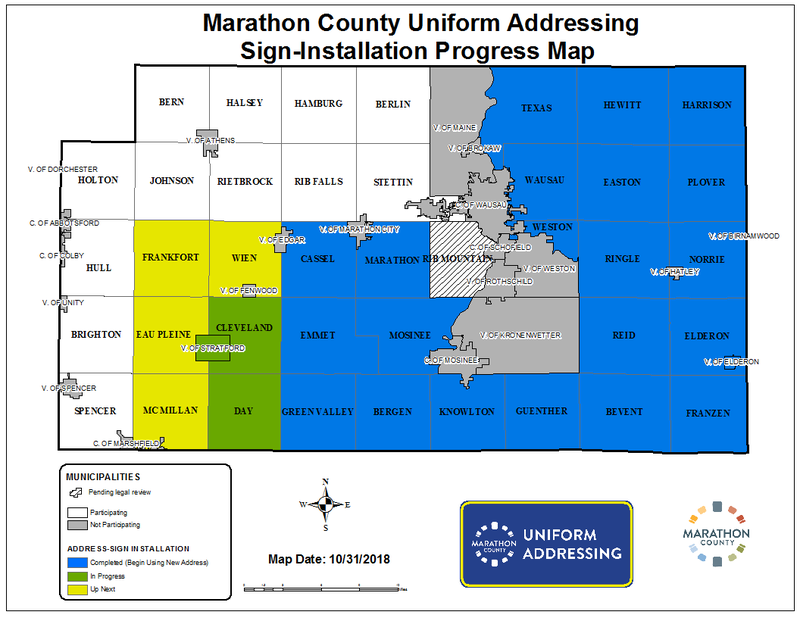 As of November 2018, nearly 15,000 new Uniform Addresses have been installed in Marathon County as part of a public safety project to transition to a grid-based, Uniform Addressing System. When your Uniform Address sign is installed, your new address will already have been updated with the national United States Postal Service (USPS) database. Many companies and online businesses access USPS data through a third-party vendor that issues updates on its own schedule. This may cause a delay in your new address being updated or verified by some companies, utilities, or online businesses. AFTER your new address sign is installed, if you’re doing online banking — or using a credit card for an online purchase or payment — and you have problems with your new address being recognized or accepted, simply use your old address until the company updates its customer address list to match the USPS database. View our Frequently Asked Questions (FAQS) webpage for answers to common questions about the Uniform Addressing project. Check out our Documents webpage for downloadable Quick Reference Guides for residents and business owners. Visit our Assistance webpage for details on in-person, live chat, and phone support for the Uniform Addressing project (provided by Marathon County Public Library staff), educational programs, and more. If you still have questions after viewing our webpages, please contact the Marathon County Conservation, Planning, & Zoning (CPZ) Department at 715-261-6000 or cpz@co.marathon.wi.us.